With World Cup fever abubble here in my California home (I've got USA in the family pool, my husband's keen on Argentina, and my son's gaga for Ghana), could not let pass this news from the site of the International Criminal Court Review Conference. In a Sunday prelude to the 2-week conference that began yesterday, the United Nations played a friendly against Uganda Dignity at a stadium in Kampala. 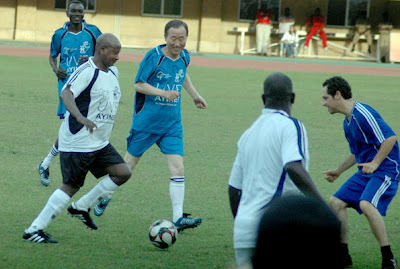 Above, U.N. Secretary-General Ban Ki-Moon, center, makes a play for a ball controlled by Uganda President Yoweri Museveni, left. (credit for photo by Stephen Wandera, courtesy of Uganda's Daily Monitor) The 2 arrived for a "six-minute cameo" toward the end of the charity contest, dubbed the "War Victims Day Football Game" and sponsored by the Uganda Victims Foundation and the Africa Youth Initiative Network aided by the NGO No Peace Without Justice. The U.N. side lost one-nil. Scoring the lone and winning goal was a "Darfur war victim, Abdallah Lasanusi." The photo's smiles-all-around exemplifies this month's theme of diplomacy, globalization, and soccer -- er, football -- popularized in books like this and this.